A lot of writers (myself included) have a hard time writing effective dialog. Not only do you have to embody the characters on a deep level (you’re actually speaking in their voice), but you have to maintain a rhythm, that carries the reader through the scene. Dialog is important enough that Elmore Leonard, an author known for great dialog, devotes three of his famous “10 Rules of Writing” to it. Eleanor Barton writes fiction and is the author of the blog “Marchelline: Adventures in the High Kingdom“. Her latest blog entry, A novice writer’s musings on the rules of dialogue, explores many of the issues that writers run into while crafting conversational scenes. She also muses on the ideas behind the various “rules” of writing and the ways in which good writers often break them. One of the biggest issues concerning dialog that she addresses is the use of “tags”, those words authors often use to denote the type of statements just issued by characters (“said”, “replied”, “proclaimed”, etc.). Acknowledging the tried-and-true wisdom of many published writers (that such tags should be avoided at all costs), Barton then conducted a very interesting test. She took about a dozen novels, opened them to random sections of dialog, and counted the number of tags used by the author. The results of her test are in her post; the point is that all of these published and known “good books” used the dreaded verbiage in their scenes. This test served as springboard to a very interesting discussion of the merits of such rules and the writing of interesting conversations. Such rules are often broken by excellent authors. So why do they bother propogating such dogma to we poor scribblers who are trying to hone our craft through emulation? Because they force us to craft our scenes in new ways, allowing us to remove the scaffolding of flowery adverbs and clunky tags to actually describe what is going on. When we finally understand how to move the scene along effectively, without the verbal training wheels, then we can begin to reintroduce such verbiage as a creative decision. We act not out of obstinacy or ignorance but with a purpose. Of course, like most things in writing, this sounds really easy but seldom works as well as you think it should. After the great discussion at “Marchelline”, I decided to challenge myself with a writing exercise in tag-free dialog. I asked my wife to come up with five situations for potential conversation. I selected one and wrote a brief scene (about 650 words) in which I avoided all dialog tags. It was much trickier than I thought but I’m pleased with the results. Writing Prompt: Write a brief scene of dialog without using any sort of dialog tag (“said”, “replied”, “proclaimed”, etc.). Below is the brief scene I came up with. Bear in mind, this isn’t exactly Hemingway, but was kind of fun to write. I found myself describing my characters’ actions more often when I didn’t rely on tags to mark their emotions. My biggest error with the scene is maintaining a “call-and-response” or ping-pong rhythm between the characters, which is a bit artificial. However, I accomplished my goal of avoiding tags for the scene. Kimber tilted her head back and forth while popping her lips like a fish as she shucked off her hi-tops and set her backpack by the umbrella stand. Her rainbow-striped socks slid easily across the slick hardwood. The short glide stopped abruptly at the kitchen doorway. Kimber rolled her eyes and crawled into one of the bar stools at the center counter. Mom leaned her sponge-mop against the side of the fridge. Wiping her forehead with one hand she retrieved two cans of soda from inside, setting one down on the counter in front of her daughter. Mom laughed, got up, and crossed to the oven. “Did you talk to Mr. Morrison?” She looked over her shoulder at Kimber as she checked the meatloaf. Mom put the loaf back in the oven and set the timer. She turned and crossed her arms at Kimber, waiting. 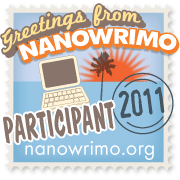 This entry was posted in Tips and Tricks and tagged dialog, Elmore Leonard, fiction, Marchelline, writing. Bookmark the permalink. I’m so glad that such a great discussion came out of that post. As I was rewriting a chapter last night, I was thinking to myself about how much the comments had helped me approach writing. Great challenge, as well!